(CNN) -- World number one Tiger Woods is to return from an injury break next week to defend his title at the Memorial tournament in Ohio. The American has been suffering from a neck injury which forced him to withdraw during the final round of the Players Championship at Sawgrass earlier this month. But he has confirmed he is back in practice for the Memorial, one of his favorite tournaments on the PGA Tour. "The doctors advised me to take a week off and rest, which I did. They prescribed physical therapy, anti-inflammatory medication and soft-tissue massages, which I'm continuing with," Woods told his official Web site. "Although I'm not 100 percent, I feel much better and look forward to competing next week." The 34-year-old is a four-time winner of the event held at the Muirfield Village Golf Club in Dublin, Ohio, which is hosted by 18-time major winner Jack Nicklaus. Last year Woods scored a flawless 65 in the final round at Muirfield -- where he has played 11 times and never missed the cut -- to beat American Jim Furyk to the title. The tournament will only be Woods' fourth event of year after the golfer took a five-month break following damaging revelations about his personal life. 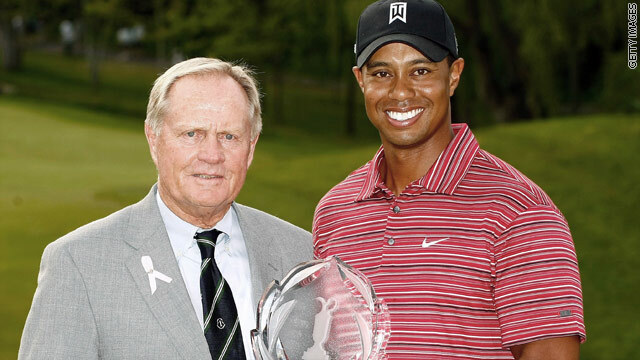 Injury permitting, the only other tournaments which Woods has definitely signed up to are the U.S. Open at Pebble Beach, California later in June, the AT and T National in Pennsylvania in July and the British Open at St.Andrews. Woods' absence from the game has caused his record-breaking 258-week hold on the world number one ranking to come under threat from rival Phil Mickleson -- who has a chance to dethrone the 14-time major winner at this week's Colonial tournament in Texas. It has also threatened his participation in the United States team for the Ryder Cup match against Europe at Celtic Manor in October, dropping out of the eight automatic spots in the rankings list.